There are thousands of types of crafts supplies available for all kinds of projects, but there are a few basic items that every crafter should always have on hand. Since you'll use most of these supplies on a regular basis, choose the highest-quality items you can afford. Scissors are simply indispensable, and no serious crafter should ever be without at least one high-quality pair. However, there are different styles of scissors for different purposes. Fiskars' Cuts+More™ Scissors can be used to cut paper, twine, wire and even open boxes. These scissors also come with their own sharpener, as well as a lifetime warranty. These are perfect for creating fancy borders on homemade cards, scrapbook pages, gift tags, and any other paper project where something other than a straight edge is desired. Armada Art makes a very nice set of 12 different edgers that come with their own solid oak stand. The set is pricier than a single pair but it's a great investment because you'll use them over and over again. Young crafters need safety scissors to protect their fingers. 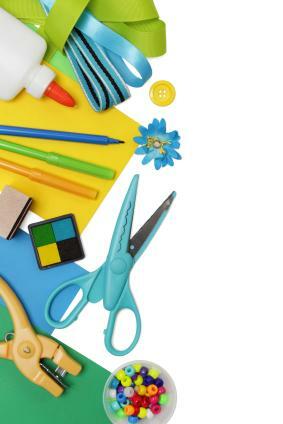 Crayola sells craft scissors made for ages four and up. Construction paper is the go-to paper for a wide range of crafts. You can cut it in long, thin strips for quilling, cut out shapes, use it for scrapbooking or origami, as well as a variety of other projects. Blick construction paper is free of acid and lignin. A 50-sheet assortment includes 10 colors. Prices vary according to selection. Scrapbook paper is also incredibly useful, and you can use it for many of the same purposes as construction paper. This paper comes in endless colors and patterns that will provide you with plenty of crafting inspiration. You can even buy it by the sheet at any craft supply store, so you never have to purchase more than you need. There are dozens of scrapbook paper manufacturers, so just make sure whatever you choose is acid and lignin free to protect your photos. Prices range a great deal per sheet, depending on the type and quality. Scissors are a must have, but never underestimate the power of a good paper cutter. This handy tool allows you to measure and cut straight edges all in one step. You can square off rectangular papers for origami, cut out frames, make greeting cards, cut paper for quilling, and trim photos for scrapbooking. Fiskars offer a top-of-the-line paper trimmer that will fulfill your cutting needs. It has the largest measuring base for its price range, and it's easy to see exactly where the blade will make the cut so you can be super accurate. This tool is lightweight, portable and reasonably priced. These are usually an adult crafter's markers of choice. They'll leave a permanent mark on many surfaces, including fabrics, wood and paper. Sharpie is the premier brand in permanent markers, and they sell a set of 24 waterproof, fade-resistant markers in a rainbow of colors that will suit any crafter. Crayola markers are a very good choice for young crafters, but adults will find them handy, too. They come in sets of 10, 20 or more, and they are available in thin or fat tips. If possible, choose a set that double as watercolors, such as Prismacolor. These pencils are artist quality, and they lay down a very smooth layer of color. Every child's craft kit should include a set of crayons, and the bigger the set, the better. Crayola's set of 96 crayons offers the most color options, and each crayon is double-wrapped to reduce breakage. Acrylics are a great all-around paint for a wide variety of craft projects. Acrylic paint is extremely versatile and can be used on many surfaces, including terra cotta, wood, canvas, and paper mache. Deco Art offers a line of high-quality, acrylic paints in over 40 shades, and the paint is water based for quick and easy clean up. Brushes are another crafting essential, and the more variety the better. Sponge brushes are great for applying acrylic paint to larger surfaces, while brushes in a variety of sizes can be used when more detail is needed. Paint brushes are also handy for applying glue. JoAnn Fabrics sell a very convenient set of 25 brushes that includes many different tips, as well as a few sponge brushes. You're almost guaranteed to have the right size brush for any craft project. 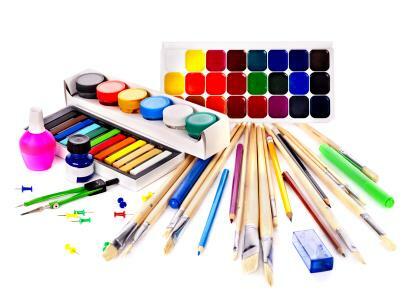 For children, a simple pack of 10 craft brushes is usually sufficient. No craft kit would be complete without glue, and the following two types of glue are both essential for a variety of projects. Aileen's Tacky Glue is a favorite with many crafters, and it's suitable for many projects where you don't need the glue to set quickly. It's non-toxic, dries clear and remains somewhat flexible. Many crafters also find that a hot glue gun and glue sticks are indispensable when they need a quick, reasonably strong bond. While you can buy a perfectly serviceable glue gun for around $3.00, you may want to invest in a higher-quality model like the PowerShot Cordless glue gun. This PowerShot comes with a convenient base that holds the gun and heats the glue, and the tip is designed to prevent dripping. Applying the glue is easier without having to worry about the gun's cord being too short or getting in your way. Every crafter should have at least a few rubber stamps in her kit, especially some that are holiday or event-oriented. You can use stamps to make homemade greeting cards and gift tags, decorate scrapbook pages, and add designs to fliers and other artwork. Stampin' Up is one of the top brands in rubber stamps, and their selection of designs is second to none. Many of their sets become collectors items that are sold for more than their original cost on eBay. There are many types of ink pads, but permanent ink pads are usually the best choice because they won't run once they are set. This means you can color in your stamped images without causing the outlines to run. 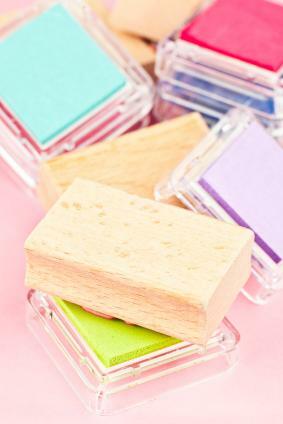 Memento ink pads come in a rainbow of colors, are non-toxic, acid-free and fade-resistant. You'll also need stamp cleaner to remove ink remnants from your stamps immediately after use. Having a dedicated craft table means you don't have to risk the surfaces on your dining room table or kitchen counter top. A simple card table works just fine, but if you need a bigger work space, consider an NPS resin folding table. This model provides plenty of crafting space, and the tabletop is heat resistant up to 212 degrees Fahrenheit. The table is sturdy yet lightweight, and you can easily fold the legs and put it away if you need the space for something else. Once you have your collection of essential craft supplies, you need a way to organize and store them. Clear plastic totes, in all shapes and sizes, can help you store everything neatly so you can find what you want when you need it without creating a mess. So what are you waiting for? Stock up your supplies, get organized, and start crafting!